David Yoshida ended up at the Wangu Sanda club by accident. The initial goal was a teaching job in Japan to continue training the martial arts he had started at university in the UK. Finding a job in Japan proved difficult, but getting one teaching English in China took just a single day. Once there, David started looking around for “kung fu” and found wushu instead. He saw a poster at the local showing two men fighting and made an enquiry. Sanda, they said, and it would be an honor to teach you. 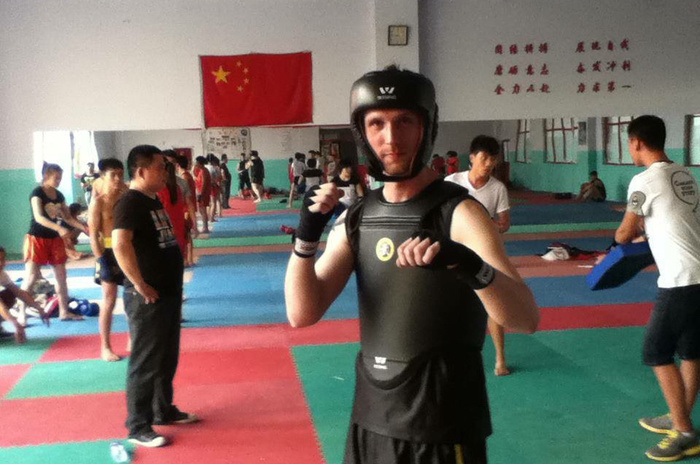 David was introduced to traditional Chinese training methods on his first day at Wangu (which means “Stubborn Stone”) including excruciating stretches, aggressive bellowing from the Chinese coaches, and an impromptu sparring match in which he was beaten down by a more experienced opponent. Right after the match, the entire gym stood and applauded David, shouting, “Great job!” in English. He’d been jumped in, Chinese style. Sanda as a combat sport completely dwarfs the mixed martial arts, BJJ and even Muay Thai scenes in China. Every province has a professional club, every city has a professional club as well as multiple private wushu clubs like Wangu teaching traditional martial arts as well as Sanda. Within each province a dozen or so sports universities have their own wushu and Sanda clubs and they all compete in local, regional, and national tournaments. All of the major China-based promotions feature predominantly Sanda fighters facing off against the other many disciplines and styles out there. Most wushu clubs focus on Sanda and performance wushu, but offer courses in boxing, Chinese wrestling, and often judo or even kendo classes. They are just starting to offer BJJ and MMA. Like most things super popular in China, Sanda is somewhat of a mystery to the Western world. International Sanda tournaments feature competitors from a dozen different nations with China, Russia, Turkey and Iran being the most prominent. Elite fighters can expect very generous compensation from their home countries, most of which sponsor the sport and help pay for facilities, coaches, and living costs. Fighting on the Sanda circuit is a job and even low level fighters can support themselves and eventually graduate up into a coaching position at a sports university somewhere. For pragmatic-minded Chinese parents, wushu isn’t their first choice for a child, but it’s not a terrible one. The wushu and especially the Sanda clubs are closely associated with the military in China. That translates into good job security for coaches, as well as opportunities to work with the PLA, one of the strongest, most affluent and most influential organizations in the country. David’s gym in particular is located in Shijiazhuang, Hebei Province, home to the 27 Group Army charged with protecting the nation’s capital, among other tasks. His coaches were ex-military and many of the students are cadets, officers, or headed for the local police force. Sanda was developed out of traditional Chinese martial arts and Lei Tai (“platform”) free boxing matches in the early 19th century for use by Chinese soldiers. Traditional kung fu and Lei Tai boxing were popular at the time, but also seen by military commanders as not particularly effective for hand to hand combat on the battlefield. The Sanda system grew out of Sanshou (free boxing) and included both striking and grappling techniques. The wushu associations began sportifying the martial arts in the early 1970s after a few decades of dormancy during Mao’s post-Liberation revolutions. Sanda and wushu were given clear rules and a point system, lethal techniques were discarded, and sports institutions across the country offering Sanda classes and training both fighters and coaches. The sport caught on quick—especially when competitors and coaches began receiving regular salaries from the state—and really exploded in the late 1990s when Sanda competitions started showing up regularly on television. Today Sanda forms the backbone of every competing Chinese martial artist’s repertoire. There are competitions going on constantly, culminating in the biggest and most important martial arts event in China, the National Wushu and Sanda Championships. Winners enjoy lifelong fame, cash payouts, and generous gifts from sponsors, well-wishers, and well-connected wushuphile officials. Wushu and Sanda in China go back at least 40 years. Thousands of martial artists have trained since childhood in sports schools, competed and traveled in their prime, and then retired to coaching. It’s a huge, organized, well-financed community of professional athletes with experience in striking, grappling and takedowns. And yet stories like David’s are few and far between. Thousands of people travel to Thailand, Japan, Brazil and even Russia to improve their martial arts—but China just isn’t on the map. One major reason is the lack of a representative with a unique Sanda skillset who impresses enough people to start a movement towards that particular style. BJJ had the Gracies, Sambo has Fedor, and Muay Thai has every MMA striker there ever was. Sanda has, at this point, only Cung Le. Le was also a wrestler and although his kicks are spectacular, there really isn’t anything unique to his kicking style that couldn’t be learned in Taekwondo, Karate or other more popular martial arts. What does Sanda offer that other styles don’t? A Sanda kick catch is a takedown technique that involves catching a kick then tripping the pivot foot. In Sanda matches, with head gear and a points system, the kick catch turns into the bread and butter move. A good kicker will be able to whip the leg and make it very hard to catch anything without breaking an arm or eardrum in the process, but it’s the technique Sanda fighters point to when discussing the elements of their style. Another big reason for Sanda’s relative obscurity in MMA circles is the fact that Sanda doesn’t really need it. The national Sanda and wushu circuit in China is healthy and flourishing. Fighters and coaches make a good living. The international tournaments are also very popular and attract hundreds of fighters, thousands of spectators, and millions in sponsorship and endorsement money for Sanda associations as well as champion fighters and their teams. If anything, the UFC needs Sanda more than Sanda needs the UFC, if the Vegas juggernaut is to expand into China in any meaningful way.